Bernie Sanders’ presidential campaign is oddly reminiscent of Barack Obama’s in 2008: heavily embedded in grassroots support and with the hope to change the system to better benefit the majority. Like Obama was eight years ago, Sanders is widely popular with college students. Sanders’ plans for free public college and eliminating student debt are some of the obvious reasons. While Sanders trails Hillary Clinton considerably in the primaries and those who don’t support him find his goals too unrealistic, Sanders seems to have found a way to do something many didn’t feel was possible: get millennials interested in politics. That ability has been evident right here on campus these past few weeks. Students, lead by UB Progressives, petitioned for Sanders to speak at UB during his campaign stop in Buffalo – with more than 3,000 people signing their names on change.org. And most importantly, UB listened. Sanders will speak in Alumni Arena on Monday night, after the Student Association took notice of students’ wants and invited Sanders to campus. The university has done its part in allowing Sanders to come, despite the fact it means they must at least offer all other candidates the same opportunity. This is how activism should be: students caring enough about politics to advocate for their university to bring in the candidate they want to hear speak. And this is how a student government and university are supposed to work: listening to what students want and making it happen. SA leadership listened to the petitioning students and took it upon itself to try to make it happen. Although SA is not paying to host Sanders in any way, it still made the initiative to reach out to Sanders’ campaign and UB to get the process started. It goes beyond dispersing the funds collected through the mandatory student activity fee, and as student leaders, that’s exactly the kind of advocacy SA should do. This was also a good move on UB’s part to allow Sanders to come. Accommodating a presidential candidate rally is no easy task, especially in such short notice. It also means UB is opening the door of possibility that others candidates will try to come to campus, although it seems unlikely at this point. Still, UB made the smart decision to listen to what students want and allow Sanders to speak. More than anything, Sanders coming to UB represents millennials taking action. Too often our generation is told we don’t care enough about politics and that even if we liked a candidate, we’d be too lazy to go out and vote. UB students – at least for the short term – proved some of those stereotypes wrong. Students organized and made their feelings known to their student government and university and now the candidate they wanted to see is coming to speak to them. It may just be a blip on the national landscape for college students and politics, but at least it’s a start. We understand that although there was a large movement to bring Sanders to campus, not every student supports him. But those students can chose to protest or boycott Sanders’ talk, or chose to go just for the chance to hear a presidential candidate speak. And if students are upset Sanders, out of all the other candidates, is coming to UB, then they should have organized and petitioned to bring the candidate of their choosing to campus. To our knowledge, Sanders is the only candidate to have made UB students feel so passionate they petitioned for him to come speak. Perhaps that will be Sanders’ lasting legacy. He trails Clinton by a significant margin in delegates and not many expect him to grab the Democratic nomination. But Sanders has done something unique in getting college students invigorated about a presidential primary race. For the evidence of that, look no further than UB. 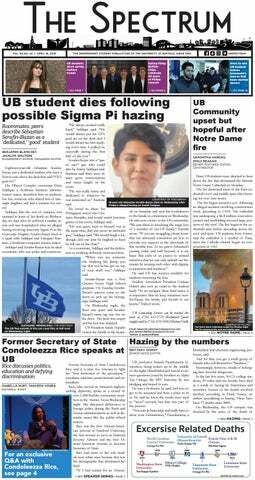 The editorial board can be reached at eic@ubspectrum.com.